The aryl hydrocarbon receptor (AHR) mediates the toxic effects of 2,3,7,8-tetrachlorodibenzo-pdioxin (TCDD) and related compounds. In some mammalian cell lines, TCDD induces G1 cell cycle arrest, which depends on an interaction between the AHR and the retinoblastoma tumor suppressor (RB). Mammals possess one AHR, whereas fishes possess two or more AHR paralogs that differ in the domains important for AHR-RB interactions in mammals. To test the hypothesis that fish AHR paralogs differ in their ability to interact with RB, we cloned RB cDNA from Atlantic killifish, Fundulus heteroclitus, and studied the interactions of killifish RB protein with killifish AHR1 and AHR2. In coimmunoprecipitation experiments, in vitro-expressed killifish RB coprecipitated with both AHR1 and AHR2. Consistent with these results, both killifish AHR1 and AHR2 interacted with RB in mammalian two-hybrid assays. 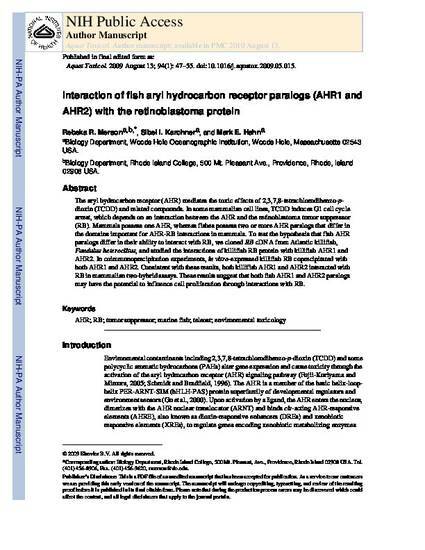 These results suggest that both fish AHR1 and AHR2 paralogs may have the potential to influence cell proliferation through interactions with RB.